On the same day that the media made me smile by reporting that Hal Steinbrenner tried to cheat the I.R.S. out of $460,000, author Jim Kaplan made me doubly happy when I read in his book that the Evil ones buried Vic Power in the minors for 5 years because his skin was too black. That’s the kind of Yankee dirt for which I’m always looking. 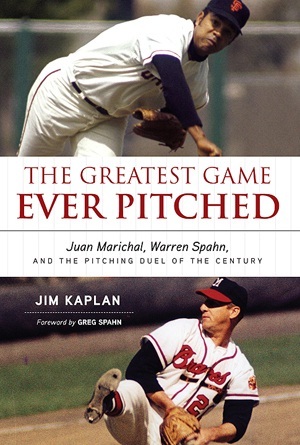 I came across this factoid in Kaplan’s well-researched and eloquent book, The Greatest Game Ever Pitched, Juan Marichal, Warren Spahn and the Pitching Duel of the Century. (Triumph, 2011.). The subject is the 16-inning duel on July 2, 1963 at Candlestick between 42-year old Warren Spahn and 25-year old Juan Marichal. The old man and the kid, future Hall of Famers. Both men pitched a complete game. Spahn threw 201 pitches. Marichal threw 227. Willie Mays beat Spahn with a solo homer in the bottom of the 16th. Final score Giants 1, Braves 0. 7 HOF’ers saw action. Spahn, Marichal, Mays, McCovey, Aaron, Matthews and Cepeda. There were 256 warm up pitches. 427 pitches thrown to batters. Great fielding plays and errors. Stolen bases and pickoffs. Singles, doubles, and a final culminating confrontation between 2 All Time Greats, Mays and Spahn. The game itself is a 16 inning delight. But if the telling of the game were all the story, this book would be very short — or so stretched out it would be boring. So Kaplan gives us much more than the game. He intersperses Marichal and Spahn’s life stories. He writes sidebars about other notable pitching duels, record games and other studies. He recreates Jack Morris’ 10-inning complete game in the 7th game of the 1991 World Series, Harvey Haddix’s 1959 13-inning perfect game loss to Lou Burdette & the Braves, the 1981 duel between Yale’s Ron Darling and St. John’s Frank Viola in which the former pitched a no-hitter for 11 innings while the latter pitched a shutout for 12. He lobbies for Johnny Sain’s HOF-worthy career as a pitcher and a coach, and details the 33 inning game in 1981 between the Rochester Redwings (with Cal Ripken) and the Pawtucket Red Sox (with Wade Boggs). All of these diversions are crisp and riveting. One thing that Kaplan does singularly well is to meld in germane insights from other authors to illuminate a point — or render one poetic. For instance, Kaplan first compares the MLB crowds of today to those of 1963. In 2011, they rock to rap music, semi-aware a game is being played. In 1963, they are focused on play completely. Kaplan borrows a line to transport us: “Immersed as they were, the fans reflected Paul Gallico’s description of baseball onlookers. ‘The crowd as a whole plays the role of Greek chorus to the actors on the field below. It reflects every action, every moment, every changing phase of the game. It keens. It rejoices. It moans.’”. There were many golden nuggets. Here are two of my favorites. Willie Mays hit 22 extra inning HR’s in his career. He is the only player to have homered in every inning from 1 through 16. I say, with everything else we know that makes Mays worthy of the title “Greatest Player of All Time”, these two additional facts help to make the case complete. One thing stopped me in my tracks. Ken Burns’ 1994 landmark Baseball documentary is breathtaking in its scope, arresting with its images, and fascinating through its use of historians, writers and artists. Kaplan makes the point that Burns all but ignored Latino ballplayers in that 10 volume work. That seems undeniable. Think about it. Burns shined the light briefly on Clemente. Marichal was absent. Tiant. Aparicio. Cepeda. Carew. Perez. All largely MIA or without emphasis. This absence in the Burns’ work is ironic given how important the film maker positions race in Baseball history. I suspect most of us watched the documentary and never even noticed. Howard Bryant’s fine recent biography of Henry Aaron brings to life the extraordinary Braves teams of 1956 to 1959, among others. Because Spahn’s MLB timeline starts fully 8 years before that of Aaron, Kaplan gives us the other end of a talented Braves continuum that stretched from Spahn/Sain/Holmes to Aaron/Matthews/Spahn. I hope Atlantans appreciate the majesty of the bloodline that connects to Maddux/Glavine/Smoltz. They should read both books. I heartily recommend Greatest Game to you. And if you have any good Yankee dirt, a la Vic Power, by all means send it my way. I’m going to miss Papelbon. I’ll miss his insane behavior, like the 2007 underwear dance on the Fenway diamond with cameras rolling and fans agog. I will miss the personality transformation he frequently effected after fist bumping Captain Porky at the BP gate, striding to the grass aside the pitching mound where he would be still and silently transform into a glaring, fire throwing mounds man. Awards eluded Pap in Beantown. Pap failed to take the Rolaids AL Relief Award even once. The honors went to K Rod (twice), JJ Putz, Mo Rivera (twice), Rafael Soriano and Jose Valverde. Rolaids or not, there were 3 or 4 years in which batters feared no one more than Papelbon. He relieved hitters of their bats. He extinguished them. Made them look hapless. Pap finished 2nd to Justin Verlander for the 2006 ROY, a year in which Verlander’s 17 wins trumped Pap’s .092 ERA and 35 saves. Awards or not, Pap was the Man in Boston. Pap posted a 2.33 ERA with 219 Saves in 6.5 Red Sox seasons. If he can continue to do what he has been doing for the next 7 years he will finish with the 5th most saves in history. Yankee fans suggest that Pap wasn’t really that effective anymore. I say he is what he has always been: one of the top 5 closers in Baseball. The Sox Bullpen has shaped up very nicely with Melancon hired for the 8th and Andrew Bailey for the 9th. The 27 year old Bailey has a 2.07 career ERA, 75 Saves and, even better, a career 0.954 WHIP. He doesn’t let put a lot of men on base. He’s a 6’3”, 240 pound Hoss, but he doesn’t throw like one. He’s a control pitcher. This all sounds good to me. If we had to lose Papelbon, at least we got a young and capable replacement. You really have to like the trade for Mark Melancon. Big Ben sent often injured Jed Lowrie and soft throwing Kyle Weiland to the Astros for the 26 year old former Yankee farmhand, who secured 20 Saves and a 2.78 ERA for Houston in 2011. Melancon. Bailey. They have lots in common. Both are young, right handed, with the size and build of a linebacker, and both are C-H-E-A-P. They are each making less than $500,000 in 2012. Melancon isn’t arbitration eligible until 2014. The Bullpen moves are a feather in the Cherrington cap. Put these guys together with “Everyday” Alfredo Aceves and the healing Bobby Jenks and one begins to feel optimistic about the 2012 relief corps. And a meaty corps it is. These 4 fellows weigh in at a combined 950 pounds. Although they are all big guys, there is some disparity in price. Andrew Bailey comes to us for just $1,937 per pound. Bobby Jenks, on the other hand, costs $26,636 per LB. And there is 275 pounds of him to go around. I believe we’ve got more imported ham than bologna in this crew. See Baby ‘Tek & the Little Perfessor on Netflix ! I stumbled across a wonderful video trove of Baseball history on Netflix. Because I have a Wii, Netflix, and internet from my cable company, I can watch Netflix on my TV. Anyone with a Netflix account, the internet, and a gaming system can do this. The trove on Netflex I speak of is 60 episodes of Talking Baseball, a 30 minute program in which host Ed Randall interviews different stars of past and present days. The galaxy of stars include Andre Dawson, Barry Larkin, Bill Virdon, Bob Gibson, Bob Murphy, Chuck Tanner, Clete Boyer, Curt Flood, Darren Daulton, Del Crandall, Dock Ellis, Dom DiMaggio, Don Sutton, Dusty Baker, Ernie Banks, Ernie Harwell, Jenkins with Stargell, Frank Howard, George Foster, Greg Maddux, Harmon Killebrew, Harry Caray, Howard Johnson, Jack Morris, Jason Varitek, Jim Leyland, Joe Pepitone, Johnny Podres, Juan Marichal, Keith Hernandez, Larry Bowa, Lonnie Smith, Luis Tiant, Maury Wills, Mickey Mantle, Orlando Cepeda, Ozzie Smith, Phil Niekro, Phil Rizzuto, Branca with Thomson, Ralph Kiner, Richie Ashburn, Vera Clemente with Roberto, Jr., Robin Roberts, Rod Carew, Roger Clemens, Ron Darling, Ron Santo, Sparky Anderson, Ted Simmons, Ted Williams, Glavine with Justice, Tom Kelly, Tom Seaver, Tony Oliva, Tony Perez, Travis Fryman, Wade Boggs, Whitey Ford, Will Clark and Yogi Berra. These shows were recorded between 1988 and 1995. 19 of these people have passed. 28 of them are in the HOF. One day, 33 of them may be in the Hall if we see Larkin, Maddux, Morris, Tiant and Glavine go in. Boggs was inducted in 2005 with 91.9% of the ballots in his first year of eligibility. He finished with 3,010 hits. Jason Varitek’s interview is a Kodak moment. The 23-year-old catcher spoke with composure beyond his years. ‘Tek explained that he had not yet sign with the Mariners nearly a year after the 1994 draft because their $400,000 signing bonus offer was $300,000 to $800,000 below what peer draftees were getting. The buzz cut, jowly faced, pre-rookie ‘Tek explained that with the advice of his agent Scott Boras, he was staying strong, in-shape, calm, and fully understanding that he could only control what he could, and would not worry about the things he could not control. Asked about his greatest talent, he cited his ability to lead others. Prescient. So boot up your Netflix and browse for TALKING BASEBALL WITH ED RANDALL. Randall is a serious Baseball man and a smooth interviewer. You’ll dig it.